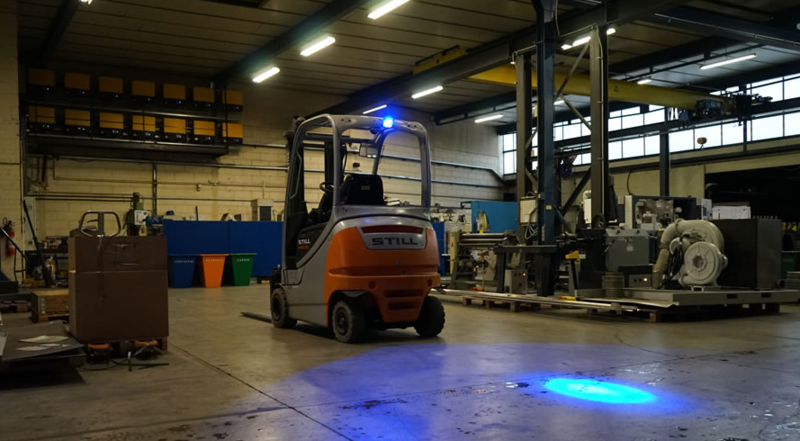 A cool new forklift light might be able to reduce accidents in loud or noisy workplaces. In one of those, “Why didn’t I think of this?” stories, the new technology appears to be a great idea. Comatra has introduced a product called the Forklift Approaching Blue Warning Light. It is made to make everyone aware that a forklift is approaching. The light will help give any surrounding workers a bright “warning” that heavy machinery is in the area. Plus, the light can also help to notify approaching personnel that the lift is lifting a load, in reverse and other special operating conditions. The main goal of the Forklift Approaching Blue Warning Light is to prevent collisions and accidents involved with forklifts. Many mishaps and hazards are caused by people not paying attention to their surroundings. That will be next to impossible with the warning light! According the Comatra’s official documentation, the CMTX-V10 Forklift Approaching Blue Safety Warning Light is a strong visual signal warning pedestrians of an approaching forklift well before the forklift is in full view. Plus, the light has LED technology, so the CMTX-V10 requires no maintenance and can last up to 20,000 hours (that is the same as 2,500 8-hour workdays), thanks to its low energy usage. Certifyme.net, much like this new warning light, thinks your safety should come first. Companies like Harley-Davidson, Siemens, Verizon and Dow use CM, and we’d love to help you as well! Our online courses have a 100% pass rate, so you’ll become OSHA compliant faster (and more affordable) thank you think. Our contact page has plenty of ways to reach us, but if you’d like to talk with our customer service team, please call (888) 699-4800. We’ll put your forklift safety program on the right track. Please check back to the CM blog for breaking news on forklift safety and other related issues. Thanks for visiting our site!